Science, technology, engineering, math – four fields that are historically male-dominated but that are simply crying out for more women. Although it can be challenging at times, to be a woman in STEM, it is incredibly important that we are represented and inspire others to follow their STEM dreams too. Here are some of the best colleges for women who wish to study in these fields. Forbes’ Best Value college ranking is accepted as one of the best and most well-respected ways of classifying colleges, and so they took this, focused on schools that specialize in STEM and then worked out the number of attendees that are women. UC is one of the most populated colleges for women in STEM with 56% of the population being female and 29% of the student body choosing to specialize in STEM. One thing that really sets them apart is the Center for the Advancement of Multicultural Perspectives on Science program, which offers support, aid, mentoring, and guidance to women – and, more specifically, Latina women in the STEM area. In fact, UC Davis is part of the ADVANCE National Science Foundation initiative to increase women in STEM careers and promote diversity, specifically within STEM professors. In Cornell University, 51% of students are female, and 30% of the student population is enrolled in STEM. They also offer the Empowering Women in Science & Engineering Symposium (EWISE) which works to bring students, faculty, and experts in the field together for workshops and discussions. There is also a yearly Women in STEM Policy seminar which focuses on subjects like government jobs in the area and salary negotiations. 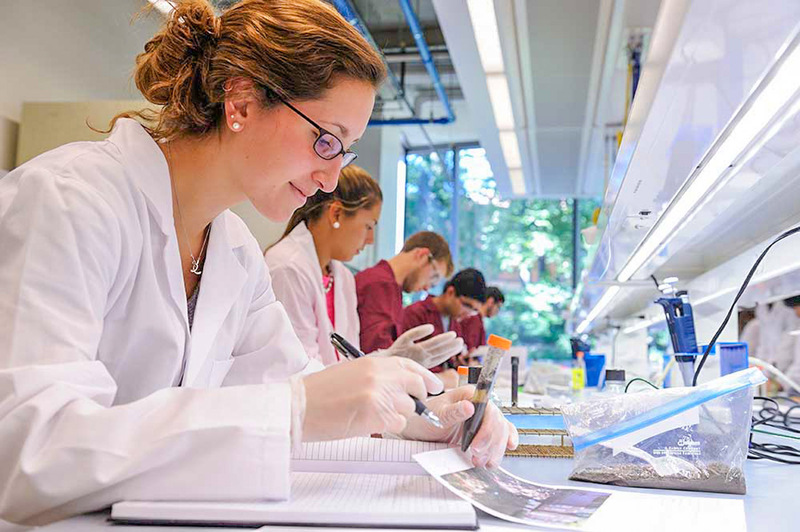 Students at JHU benefit from attending the first research university in the country which offers over 50 majors – of which neuroscience and biomedical engineering are some of the most popular. 51% of JHU students are female, and they have a strong history of notable women in STEM who have graduated from the school such as Professor of Physicals at Yale, Dr. Meg Urry who was on the faculty for the Hubble space telescope, and Rachel Carson who worked to ban DDT back in the ’60s. Based in St. Louis Missouri, women in STEM is an important focus for Washington University, and as such they even hold a Women in STEM Day for high school students in the local area, hosted by members of the Society of Women Engineers. There is also a specific fun set up for women in engineering, to help them access networking, advice and events – particularly widening participation from minorities and those who may not have the financial ability to access some of these opportunities. So if you are going to be the next Marie Curie, Chien-Shiung Wu or Augusta Ada King-Noel, Countess of Lovelace, these are the colleges you are going to want to apply for. Nothing is stopping you from being just as good (if not better) than the men in the field. Good luck!